"Short on time? Five ingredients and four steps make this dish easy and delicious. Increase the nutritional value and make this an all-in-one dish by adding fresh seasonal vegetables (such as broccoli, squash or bell peppers) to the pasta as it cooks." Bring a large pot of lightly salted water to a boil; cook pasta at a boil until tender yet firm to the bite, about 8 minutes; drain. Sprinkle chicken with Italian dressing mix and garlic powder. Pan-fry chicken in a nonstick skillet over medium heat, cooking in batches if necessary, until the juices run clear and chicken meat is no longer pink in the middle, about 10 minutes per batch. Turn chicken pieces over after about 5 minutes of cooking. Transfer chicken to a serving bowl and toss with cooked pasta. 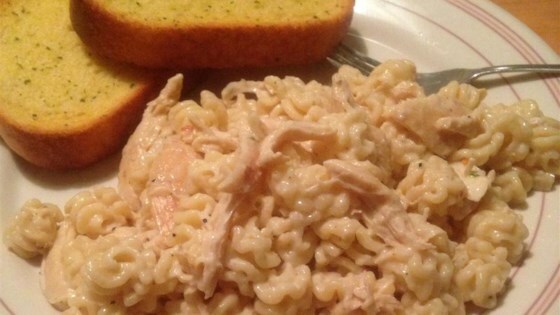 Pour Alfredo sauce over chicken and pasta, mix thoroughly, and serve. Easy, and a great use for leftover chicken that I had. What a easy recipe, using prepared alfredo sauce-perfect for any dinner-salad and bread, and dinner's on the table! Might as well order out! Or just read the side of the jar. It tells you exactly what to do! used Wegman's alfredo sauce and added broccoli. Very, very good. I used 1lb. of chicken. Didn't mix the pasta with the sauce and chicken. Used the Italian dressing package to taste. Added peas. Very easy and my family liked it. Thank you! This is a good recipe. I used Prego Alfredo Sauce and it turned out great. I didn't use garlic powder but I used minced garlic while cooking the chicken and the Italian dressing mix together.? ?